Following a two-year hiatus, the Honda Ridgeline crossover pickup truck returns. Beginning in 2006, Honda sought to turn pickup truck convention on its head, by building a car-based model. Early on, sales were quite strong as the Honda Ridgeline siphoned sales from competitors while also attracting a new breed of truck shoppers. But those initial sales were not sustained. In fact, they began to fall drastically, then after nine years the Ridgeline was discontinued. However, the end was far from final as Honda had a new model in mind. 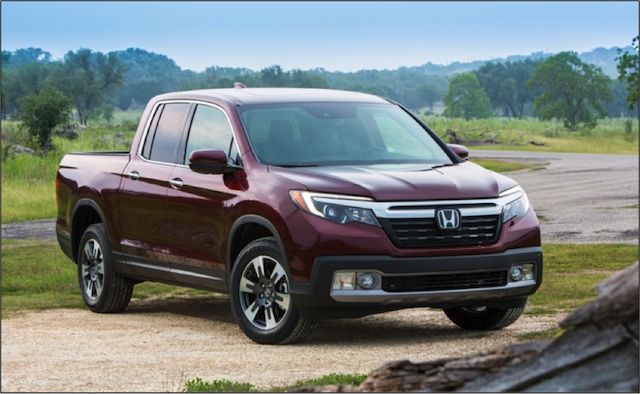 Today, Honda offers the 2017 Ridgeline, an all-new second-generation midsize model in an effort to recapture customer interest. To that end, we’ll examine the important “numbers” defining this model. 4 — Four is the number of doors found on every Ridgeline pickup truck. Four also represents the number of feet between wheel arches in the pickup truck bed, allowing customers to flat haul drywall and plywood. No other midsize pickup truck can boast such a broad width. 19/26/22 — Fuel efficiency and pickup trucks are a tough combination. Few people buy them with maximizing fuel efficiency a top priority, but if your truck isn’t making at least 20 mpg, then you may be in for a world of hurt. For the first time, Honda is offering a front-wheel drive Ridgeline, EPA-rated at a respectable 19 mpg in the city and 26 miles per gallon on the highway, for a combined 22 mpg. Choose all-wheel drive and you’ll see those numbers drop by 1 mpg. The Ridgeline’s numbers are particularly impressive, given that the 2016 Nissan Frontier with a 2.5-liter, four-cylinder engine delivers 17 mpg in the city and 23 mpg on the highway. By the way, a 19.5-gallon fuel tank is present in the 2017 Ridgeline. 210 — The 2017 Ridgeline is longer, wider and taller than the outgoing model. It measures 210 inches from stem to stern or 3.1 inches longer than the previous model. The big gain is found between the wheels — this model has a 125.2-inch wheelbase, the first-generation Ridgeline was 122 inches long between the wheels. That’s more interior room, making this truck better suited for some owners. The Ridgeline is 78.6 inches wide (a 0.8 increase) and 70.8 inches tall (for a gain of 0.5 inch). Four inches were also added to the bed length, now measuring 64 inches or 5-feet, 4-inches. 280 — The previous Ridgeline made 250 horsepower and 247 foot-pounds of torque, respectable numbers both. The latest edition should be a crowd pleaser as it makes 280 horsepower and 262 foot-pounds of torque. Of big benefit are two things: a new 3.5-liter, direct-injected V-6 engine, variable torque management, and a 6-speed automatic transmission. This combination enables the current Ridgeline to achieve better acceleration and improved fuel economy over the previous model. 400 — The number of watts in the Ridgeline’s AC power inverter is 400. Not only that, but the inverter is part of the first in-bed audio system found in any pickup truck. The inverter is located behind an access panel found in the right bed wall and works with six exciters placed in the bed walls, replacing conventional speakers. The inverter has the capacity to recharge power tools or provide energy for a flat-screen television or a blender. Tailgate parties, anyone? 1,584 — Payload capacity is a big deal with truck buyers. After all, if you can hold ‘em and haul it, then you’re not in the game. The payload numbers come in at 1,584 pounds or 38 pounds more than the old Ridgeline. Comparatively, the GMC Canyon payload is 1,410 to 1,600 pounds; the Chevrolet Colorado offers 1,370 to 1,630 pounds; Toyota’s Tacoma ranges from 1,120 to 1,620 pounds; and the Nissan Frontier ranges from 919 to 1,475 pounds. Clearly, Honda’s engineers did their homework. 5,000 — The main area where the Ridgeline is clearly outclassed by competitors is in towing. Choose the RT AWD model and you’ll hit this truck’s 5,000-pound towing capacity. That’s still a robust number and it matches the earlier Ridgeline. Of course, for truck shoppers in this segment needing more pulling power, then the Chevrolet Colorado and GMC Canyon at 7,000 pounds, Nissan’s Frontier at 6,500 pounds, and the Toyota Tacoma at 6,400 pounds towing capacity may be too hard to pass up. 29,475 — The starting price for the 2017 Honda Ridgeline is $29,475. Yes, that’s right: nearly $30,000 for this midsize truck. Available in RT, RTS, Sport, RTL, RTL-T, RTL-E, and Black Edition trims, the top end model will reach just above $42,000. That’s a lot of moolah for a truck in this class. Shoppers looking for value in this segment will have to look elsewhere. A base Nissan Frontier king cab is the price leader here, starting at $18,290. The comparable-to-the-Ridgeline Frontier crew cab starts at $23,500 or nearly $6,000 less than the Honda. Price creep in recent years has made affording a smaller pickup truck more difficult for buyers. Although segment sales are strong, you have to wonder if Honda’s base price is simply too high. Numbers only tell you part of the story about any vehicle. There are a lot of features about this truck that simply cannot be numerically quantified. One feature making a return is the nifty in-bed trunk that has always played an important part of the Ridgeline ownership experience. The new model comes with a fully flat floor and as before it is drainable and lockable. Speaking of the bed, it comes with eight 350-pound tie-down cleats. As for the tailgate, it is a dual action layout as it is hinged both on the left side and on the bottom, making it easier to reach, load, and unload heavy items. Photos courtesy of Honda Motors America.